As a small business owner, you know how precious your time is and it is often in short supply as you try to keep on top of sales, paying invoices, networking, advertising – and all the other aspects of running your business. Finding ways to help make your processes more streamlined and efficient can play a big part in ensuring you can run your business smoothly and with as little stress as possible. Maybe you’ve heard AutoEntry and Receipt Bank mentioned on a business forum you belong to, or your bookkeeper or accountant have suggested using them. In this blog I am going to explain what they are and how they can help you. 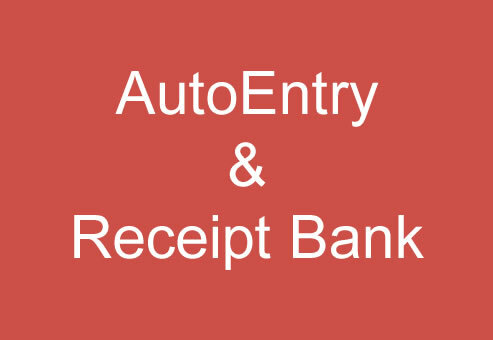 What are AutoEntry and Receipt Bank? AutoEntry and Receipt Bank are two pieces of software that can help automate the task of entering purchase invoices and receipts data into your accounting software. They can make the whole process of entering invoices and receipts into your accounting software more streamlined and efficient. How can they help make it easier to run your business? verifies the accuracy of the data. Will AutoEntry and Receipt Bank work with my current accounting software? You can use AutoEntry and Receipt Bank with a number of different online accounts packages including QuickBooks, Xero, Sage, Kashflow and Free Agent. You can find a complete list of packages on their websites: AutoEntry and Receipt Bank. How much does AutoEntry and Receipt Bank cost? When it comes to pricing – each software works in a different way. Users a credit system where you pay for a set number of credits per month (any credits you don’t use are rolled over for a 3-month period). The number of credits used for each upload depends on the features used (ie 1 credit for invoices/bills/receipts, 2 credits for line items extracted, 3 credits for bank and credit card statements – per page). If you run out of credits you can use up to twice the number of credits for your current subscription – you are then charged at the same rate and added onto the next month’s bundle. You can have as many users as you need at no further cost. A free trial period is available. Costs start from as little as £9/month for 50 credits. You are allowed to submit the number of items per month as your plan allows. There is a fair usage policy where you are given a bank of the number of items for a 3-month period – if you need to submit more items one month, you aren’t charged extra as long as you don’t go over the total items allowed in that period. (For example, if you are on the plan where you get 50 items/month, you would get a bank of 150 items/3-months – if one month you submit 75 items, month 2 you submit 25, and month 3 you submit 40 – as long as you don’t go over 150 items in total you won’t pay any extra). You are prompted to update your subscription level based on how you regularly use the system (ie if you regularly submit more items than allowed). Single User plans (suitable for a sole trader) starts from £9.99/month for 50 items/month. Multi-User plans start from £20/month for 50 items/month – you can have as many profiles on the multi-user plans as needed. For work at home busineses, I recommend AutoEntry. I use AutoEntry with several of my bookkeeping clients in conjunction with QuickBooks Online. I have used it for uploading and entering supplier invoices into the accounts, and it made the process of entering the data into the accounts much easier and efficient. The clients can have the app on their phones, and they can easily snap photos of parking receipts, train tickets, or refreshment receipts while they are out and about meaning they don’t lose the paperwork and it’s all uploaded to the accounting software. By having clients send supplier invoices straight to the dedicated e-mail address provided, we’ve cut out a step in the process and made it far more streamlined. If you would like to talk to me about how I can help make your bookkeeping processes more streamlined, please don’t hesitate to contact me. 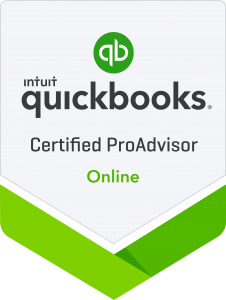 After I gained my ProAdvisor certification with QuickBooks Online, I wanted to do the advanced certification, but it was only offered in a classroom-based setting which unfortunately wasn’t suitable for me due to my mobility issues. There was talk of them eventually doing the training over distance learning so I was eagerly awaiting that day. It happened by chance that I saw a post from someone on a Facebook group I use, saying that two of the QBO trainers were going to be offering the Advanced Certification through a series of webinars. I signed up to do the courses straight away and counted down the days before they would start. The training was offered over 4 2-hour long webinars and each session had a booklet that you would need to work through. You had to complete each workbook before moving onto the next session. Before starting the webinars there was a pre-workbook to complete which was basically just getting the training company file created on the online portal. Each session covered several topics that went further than the basic training. Session 1 covered setting up a company, the best order for importing data, importing customers and suppliers and how to deal with special accounts when setting a company up. I’ve already set up a few client accounts on QBO, but I did find this more in-depth look at the process to go through very useful and will be ensuring I follow this process for any future accounts I set up. Session 2 covered complex banking transactions like ones you would need to deal with if you had a retail client (so till receipts for example), job costings and using sub-customers, timesheets, foreign transactions, PayPal, banking rules, and many other topics. It was quite a coincidence that just as I was learning about how to deal with retail clients that I actually signed up my first retail client! I’ve already put the template in place for dealing with Till Receipts as per the instructions from the course, and have found it extremely useful. Session 3 focused on special VAT set-ups – so how do to do corrections, the different rates, EC sales lists, partial exemption and the Flat Rate Scheme. It also looked at period end and the various things you need to look at when closing off a set of accounts, and special company setups like charities and legal practices. The VAT section was really good and I know I will be using a lot of the tips from this for my VAT registered clients. The section on the Period End showed me a lot of tools on QBO that I didn’t know about – things like how to merge debtors/creditors/nominal accounts and how to reclassify transactions. The reclassifying tip is one I will most definitely be using with clients when we discover incorrectly coded transactions. Session 4 was all about reports – budgets, how to customise reports, and management reporting. I am hoping I will be able to help my clients to use all of the features of QBO to their fullest. There are a lot of great reports in the software that can give you a very in-depth look at the financial position of your business and I look forward to helping my clients discover them. At the end of the final session we were provided with information on how to access the exam. Before I requested access, I rewatched the webinars to make sure I did not miss anything. The exam was broken down into 7 sections and you were allowed to use your notes to help you. There were a couple of questions I wasn’t 100% sure on, but at the end of the 2 hours I was rewarded with a very good mark and am now an Advanced Certified ProAdvisor. I am looking forward to putting everything I’ve learned into place so that I can help my bookkeeping clients to grow their business. I am always on the lookout for further training that I feel will be beneficial to my clients. 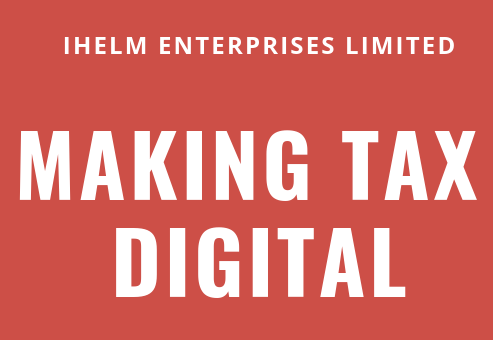 If you would like to contact me to discuss how I can help you with your accounts, send me an email to info@ihelm-enterprises.co.uk. 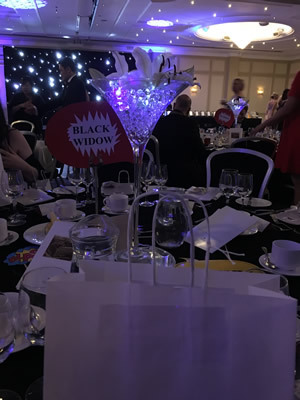 We needed to attend the awards ceremony which was a black-tie event held in Birmingham at the MacDonald House Hotel. 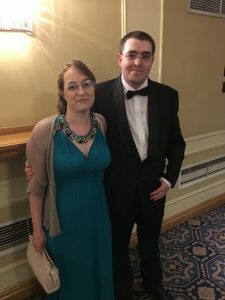 I had never attended a black-tie event before so of course I started to panic about what to wear, what would it be like, would I feel out of place. I had a dress worn to a number of events previously and I had jewellery to bling and a lovely pair of shoes, so at least I was sorted on that end. Michael even got himself some spiffy new clothes. 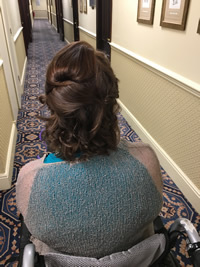 The day before, I had my nails done by Sarah from Glamourize, and I was going to have my hair and makeup done at the hotel. I don’t think we turned out too bad! I was really nervous about going as I didn’t really know anyone apart from talking to them on the FB Group. I was worried I wouldn’t fit in or have anyone to talk. I was so wrong! Charlotte (The Bournemouth Wrap Girl) was the first person to speak to me – she recognised me from the group and she was so lovely and friendly – it really put me at ease. 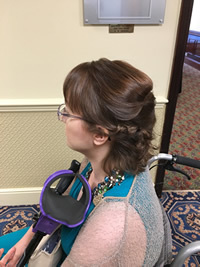 The girls who did my hair (Deborah from House of Hair) and makeup (Alexandra from A.B Beauty) were absolutely fab and helped me to gain even more confidence. There was a drinks receiption to start the evening, which was quite daunting. 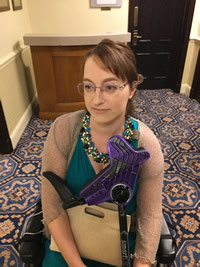 I tried to remain as inconspicuous as possible which is no mean feat when in a wheelchair. 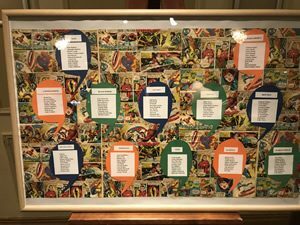 We went to the seating plan and discovered the theme for the night was “Superheroes”. I was pleased to see that Charlotte was sitting at the same table. On entering the function room – all I can say is wow! The decorations, the atmosphere – it was all so amazing. 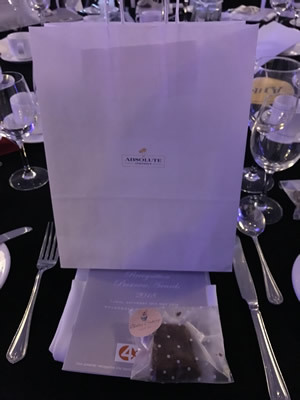 There were gift bags at each table and a special sweet treat from Belles Cakery – omg the brownies were absolutely delicious!! The host for the night – Dave – kicked things off and really put everyone at ease and in the mood for fun and celebration. Throughout the night the awards were given out between courses and everyone was encouraged to get to know each other. 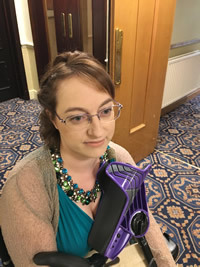 A young woman named Carris spoke to us about brain tumours and how the charity, The Brain Tumour Charity, doesn’t get any government funding and she hoped we would help the charity out. It was a moving talk – you could have heard a pin drop in the room. As the time got closer to the “Against All Odds” category, I could feel butterflies in my stomach and I was really anxious. 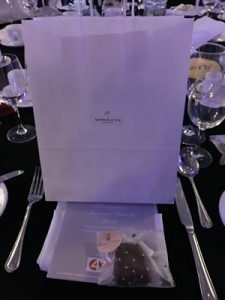 I didn’t win – the judges found it really hard to choose as all of us in the category had overcome so much – but it doesn’t matter to me because I am a finalist. 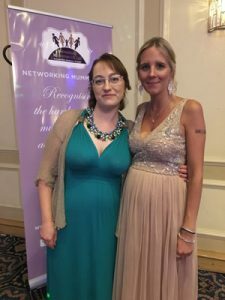 It was the first business awards I had ever entered and I’m so proud of what I achieved. The night ended with a raffle and dancing. Michael and I both won a raffle prize. We didn’t stay for the dancing as I needed to take my medication and get some sleep. 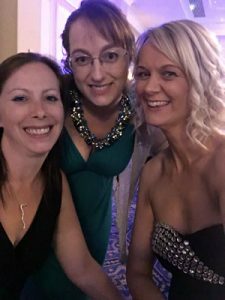 I’ve come away from the awards with some new friends and even more determination. I know my business can work – there are tons of businesses out there of all sizes that need a bookkeeper – I just need to find a way to reach out to them. There are plans for Ihelm Enterprises and I am going to work hard to put them in place. 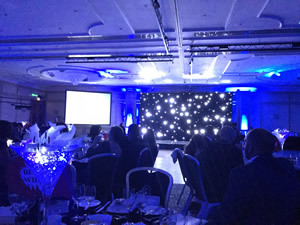 There are also other business awards out there, just waiting for people to enter them – and now I have more confidence in myself and in what I do – I will be submitting more applications. It’s been an interesting couple of months for me. 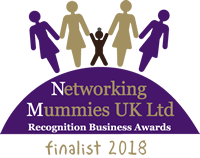 In March, on a whim, I decided at the last minute to enter the Networking Mummies Business Recognition Awards 2018 – I think there were about 10 minutes left before the deadline. I didn’t enter a specific category – I just filled out the nomination form with as much detail as possible. I hit “Submit” and didn’t tell anyone what I had done. I didn’t really see the point as I doubted that anything would come of it. 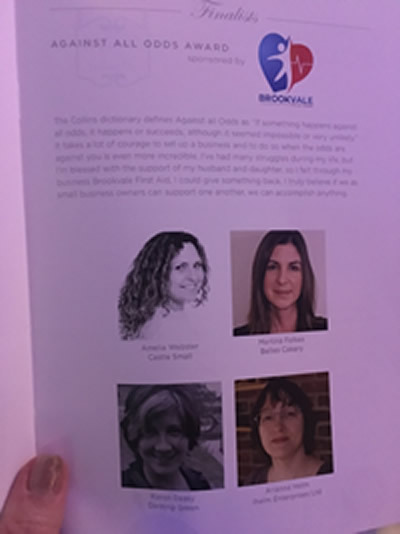 March 13th arrived and when I opened my e-mails I had the shock of my life – an e-mail with the subject heading “Congratulations You Are A Finalist” – jumped straight out at me, and I was shaking as I read the contents which told me I was a finalist in the “Against All Odds” category!! 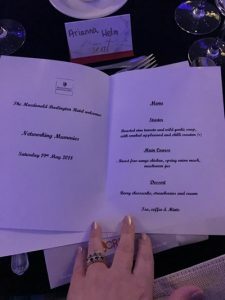 In the 14 years I have been in business, these were the first awards I had entered, and I was a finalist – I couldn’t believe it and I’m sure I was in shock! I remember trying to get a hold of my husband, Michael, and when he didn’t answer for the 3rd time, I messaged a good friend, Shirley, to tell her – I needed to tell someone. Eventually, I got a hold of Michael and I know as I told him what I had done and what the e-mail said, I was shaking like a leaf and my mind was whirling. He managed to get me to focus and told me I needed to first of all sort childcare out, sort tickets, hotel etc. Thankfully a friend was able to have our daughter on the big night and from there everything just fell into place. As a finalist, I was provided with a press release template to send out to local newspapers/radio stations etc. I spent a lot of time writing and re-writing the press release and getting help from people on the FB business groups I belong to. It was finally completed and just after Easter, I sent it out to a number of local papers and to my bookkeeping association. I had a response from the group who deals with the Lancashire Post and my bookkeeping association. 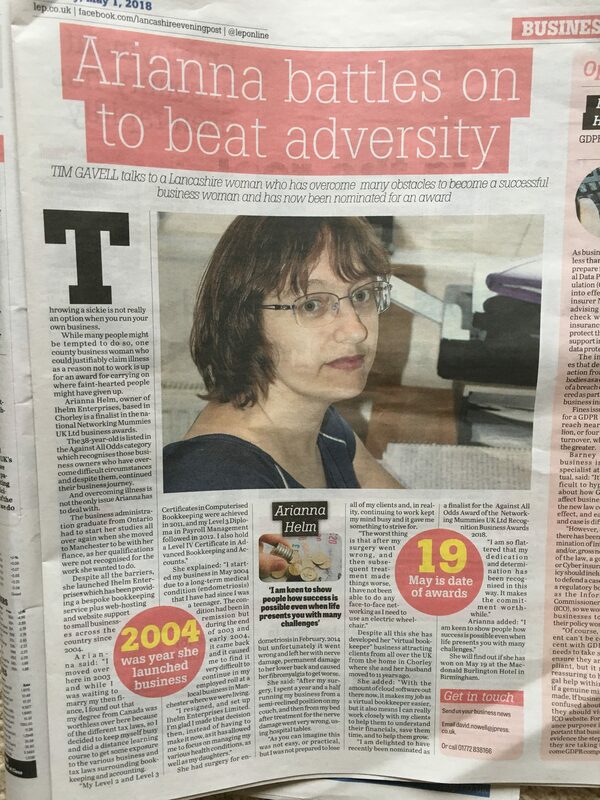 There were many e-mails back and forth which resulted in a full-page spread telling my story in the Lancashire Post!!! My bookkeeping association also did an article on me – they included me in their May newsletter in their Member Profile Section. However, while I was being interviewed for the Member Profile, I was asked if I would also allow them to feature me in their Top 100 Influential Women in Bookkeeping. I admit that I ended up crying on the phone. I don’t consider myself to be doing anything special, I am just doing what I must. Life dealt me a hand that I wasn’t expecting or prepared for and I had two choices – play it the best I could or fold and give up. Well those who know me will know that I am not a quitter so there was no way I was giving up my dreams. I have found ways to continue to run my business and to be part of my family, and I have no plans to give up anytime soon. If my story can help others see that no matter what life throws at you, you can still achieve your dreams, I will be happy. After using QuickBooks Desktop software by Intuit for 13 years, Arianna decided to embark on training to be a QuickBooks Online ProAdvisor. She has worked very hard over the last few months, fitting her training around client work and home responsibilities. On Monday March 20th, 2017 Arianna took the online exam which covered all aspects of the software and became a Certified QBO Advisor. During her training, Arianna covered many aspects of QBO from setting it up for the first time right through to creating custom reports that clients can create with a touch of a button! This new qualification fits nicely alongside the QuickBooks Desktop ProAdvisor Certification she earned in September 2016. Gaining the certification for QBO means that Arianna is able to assist her clients in taking the steps necessary to have better control of their finances, a better understanding of their cash flow and preparing them for Making Tax Digital. We look forward to helping our clients with growing their business. We can’t wait to see what 2017 brings! Below are 10 helpful tips on how you can keep your records straight. Have a separate business bank account/PayPal account etc. File all invoices and receipts in separate monthly folders. Keep “paid” and “unpaid” invoices separate. Set aside an hour every week to keep your purchase ledger and sales ledger up to date. Enter petty cash receipts either weekly or monthly and ensure they are fully reconciled each time. Reconcile your bank/PayPal accounts every month. If you paid for something personally, note it on the receipt and whether it is a loan or an investment. Mark invoices as PAID and put on them how they have been paid – cheque, cash, bank, etc. Store the paperwork for each financial year separately so you can access it easily if needed. And FINALLY…and probably the most important is to just keep on top of your paperwork. If you would like more information on how we can help you with your record keeping, please contact us via the Contact Us Page, our Facebook Page, or on Twitter. By the end of this post, you will know what a bookkeeper does and what an accountant does. Bookkeepers and accountants regularly work together to ensure that a business is receiving the best advice and support possible. It is very important that before hiring a bookkeeper or an accountant, you check that they are registered with a professional body and that they hold a valid practicing certificate and insurance. Do not be afraid to ask them to see their certificate or credentials. A bookkeeper in the UK should be registered with either the ICB (Institute of Certified Bookkeepers) or the IAB (International Association of Bookkeepers). An accountant in the UK will be registered with the ICAEW (Institute of Chartered Accountants in England and Wales), CIMA (Chartered Institute of Management Accountants), CIPFA (The Chartered Institute of Public Finance & Accountancy) or ICAS (The Institute of Chartered Accountants of Scotland). Come back tomorrow to find out the Top 5 Reasons Why Your Business Needs a Bookkeeper! If you would like to know more about the bookkeeping services we offer, have a look at our bookkeeping page, or contact us via the Contact Us Page, our Facebook Page, or on Twitter. In yesterday’s post, we talked about the differences between a bookkeeper and an accountant which one you needed. Today we are going to talk about the top 5 reasons why you need a bookkeeper. Frees up your time – By having a bookkeeper, the time you would have spent on your accounts is freed up. You can then put that time to better use by using it to promote your business and get more sales. The accounts will be done correctly – A qualified bookkeeper will know exactly how the accounts will need to be done. This means that if HMRC checks your accounts, they are less likely to find any mistakes and fine you. Better idea of the financial state – A bookkeeper will keep your accounts up to date on a regular basis. This means that you can have a more accurate picture of the financial status of the business, instead of waiting until the end of the tax year. Know who you owe and who owes you – If you are struggling to chase your clients for payment, or you are being chased, a bookkeeper can help keep your purchase ledger and sales ledger up to date. They will be able to send statements to your clients and get payments in. They can also make sure you are paying your suppliers on time. When you have employees – As an employer, it is more important to make sure you are paying the employees & HMRC the correct amounts and on time. A bookkeeper will make sure all of the payroll calculations are 100% correct and that everything is filed with HMRC on time. If you think you might need a bookkeeper or want to have a chat about how we can help, contact us on the Contact Us Page, our Facebook Page, or on Twitter.